The Market Place provides domain specific email for our clients. Our email server provides unlimited space, and you can access the email we provide directly from the server 24/7 at http://email.YOURDOMAIN.com. Once there you just enter your email address and password. Then you will have a very familiar webmail interface with folders, search, a help menu, email signatures, and even out of office auto-reply options. Our email is compatible with email clients like Outlook. This article will provide important links and resources to help you troubleshoot email problems you may have with Outlook. Outlook is not working does not mean you don’t have access to your email. Until the problem is fixed, you can login to webmail to send and receive message. Step 1: Determine if the problem is with the email server, or somewhere else. Login to your webmail at http://email.YOURDOMAIN.com. If you can login, your email address and password are correct. If you can send and receive email- then the email we provide you is working properly. Proceed to step 2 for options related to your software, computer or ISP. If you can’t login, you may have changed your password and/or forgotten it. If you have forgotten your password, please call us at 352-821-0774 for a new password. We CANNOT tell you what your old password was; we can only create a new one for you. Step 2: Restart and check for updates on any/all software and devices. The issue could be with any number of software programs or devices such as your computer, your version of Outlook, your wifi, your router, your ISP. Sometimes a simple restart can resolve the problem. Check your software and devices for updated software/firmware versions too. These updates sometimes fix the issue. Step 3: Double-check your settings. Adding server and account information can be tricky; it’s easy to mistype a letter or two. Double-check that you’re using the correct incoming and outgoing servers (host names), email address, and password to connect to your email account. Your user-name or login must be your WHOLE email address- not just a portion of it. Your outgoing mailserver should always be smtpout.secureserver.net Your incoming mailserver depends on the account type you first set up. You MUST use the same account type across all devices- DO NOT MIX POP and IMAP. Login into your webmail as described above. 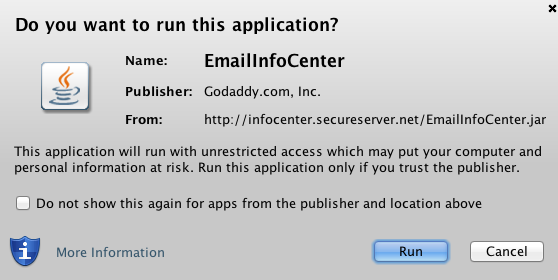 Then go to TOOLS > EMAIL INFO CENTER. 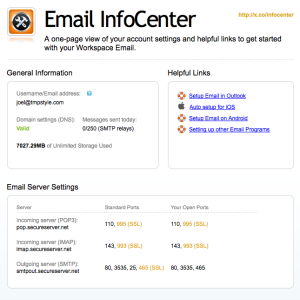 The email info center is an interactive page that will attempt to connect to your computer, determine the best settings for you, based on that location (ISP) and computer/software. If you are presented with a dialog box asking for permission to run a program, please allow it, so the tool can do its job. After you allow the the tool to connect, it will determine the best settings for you- keep in mind that while many ports are possible, some ports work better with certain ISPs, and this is beyond our control. In the example below, you can see the tool has determined the best ports for my computer, at this location. To edit your ports, you go to TOOLS > ACCOUNTS > EMAIL, and then select the account that has the problem and choose edit/change. Find the port settings, and change them. Then save your way out of that dialog box, restart your Outlook and see if the problem is fixed. Step 5: Persistent “Enter Network Password” error. If you have tried the steps above, are certain you are using the right password, and have checked the box to “remember password” and the error still persists, then you should read this article form Microsoft which may help.